Friction sawing is not an entirely new concept in cutting. 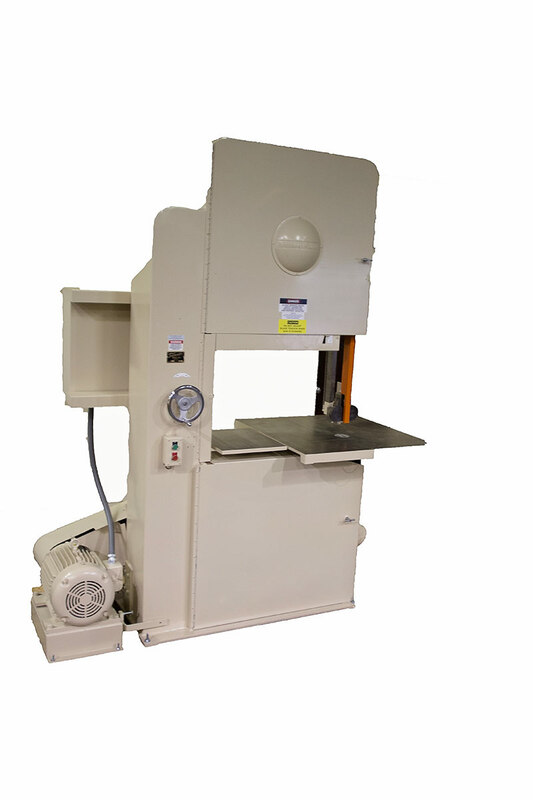 Several distinct advantages are apparent with the use of the Tannewitz band saw for friction cutting. Less horsepower is required; contour cutting possible; the thin band tool had less kerf than circular blades; and irregular pieces could be cut without support since there was very little down drag or pull during band friction sawing. So, there was an entire new field of cutting developed from an old cutting principle. To better understand the cutting action, let us take a look at the principles behind friction sawing. In friction cutting or burning, the heat generated is a product of some co-efficient of friction of the metal or metals in contact, times the pressure, time the distance moved. Note that speed is not mentioned. The BTU’s of heat generated depends on the pressure, the kind of material, and the distance moved, and is not affected by the area of contact nor the tie or speed. Bearing this in mind, we can explain the way of doing certain thigs in successful friction cutting or any other application of frictional heat. This also explains why a toothed blade is more successful than a solid band. The pressure exerted by the operator is transmitted to the teeth making contact with the work. This makes for high pressures in contact with the work and more heat at the point of contact. The teeth of the blade also carry fresh air and oxygen into the cut to increase the burning action. First, we must consider that heat tends to dissipate by radiation, convection and conduction. We have a definite amount of heat generated that we want to use in melting a certain area or amount of material so we must concentrate this heat to the material we want to melt and prevent dissipation as much as possible. In sawing, we want to melt the material in the kerf, so we make that material one of our friction pair; one-half of our heat will be generated in the material we wish to melt and remove, and the other half will be generated in our saw blade, which we do not want to melt. Radiation will be minor as the area heated will be small and enclosed on at least three sides, for the same reason convection will be negligible. But conduction will be high as it can flow into the contiguous material in at least three directions; however, heat will travel a certain speed in each of the various materials and will not be hurried. That is why we must use very high speed so our heat will not dissipate before it attains the temperature necessary to melt or burn the material we want to remove. Temperature is the quotient of quantity of heat divided by the mass of the heated material. If we use speed to keep the heat largely concentrated I the minimum amount of mass and use speed to feed the BTU’s per unit of frictional distance very rapidly, we soon attain a temperature which burns away the material in the kerf. If we feed fast enough and the saw runs fast enough, the heat conducted into the surrounding material will be negligible. The heat in the saw blade is spread over the entire periphery or length of the blade and radiation and convection have free play for about 99% of the time. This being about the proportion of the entire blade that is in the kerf at any instant of time. This is the theory of friction heat. Now let us consider how this theory applied to band friction sawing. We use a band saw running at very high speeds, the machine has very strong wheels to withstand the high speeds. Since this cutting I on the friction principle, it I not necessary to discard a blade when it has become dull. In fact, just the opposite is true, the more resistance that we obtain from a dull blade, the faster the cutting action. The only reason for discarding a blade is that it has broken from high speed flexing. Since larger wheels cause less blade flexing, it is mandatory that large wheels be used or machines that are designed for friction cutting. The most common size wheels used for friction cutting are 36” and 42” diameter. The blade traveling at a nominal friction cutting speed of 12,000 feet per minute and having 10 teeth per inch or 120 teeth per foot passes 1,440,000 teeth per minute through the kerf. In other words, we have 24,000 active teeth every second and in material 1/5” thickness, the blade would be in the kerf for any abut 1/12,000 of a second. This speed is what prevents the heat from traveling into the adjacent material to any great extent. This being a melting, burning action, the hardness of the saw or the material being cut does not affect the action except in the change of the co-efficient of the friction. Therefore, we select a saw only with the idea of getting one that will stand the constant flexing around the wheels for the longest time. We need a good wide set in the teeth to minimize side friction of the blade. The saw blade manufacturers have kept these requirements in mind when developing their special friction sawing bands. The teeth in the friction band have a special purpose in that they carry oxygen enriched air into the cut and it becomes a melting, burning operation in the same way that we make an oxygen-rich flame in our cutting torch to facilitate the actual burning of the material. As you approach the limit of the material thickness, you should tip the piece to present for an instant a much shorter kerf. Once the flame is started, the cut will proceed with ease. This flame in one of the cobalt blue-white color indicating that oxygen is combined with the iron. Emphasizing once again that this is a melting, burning operation, the metal that is being cut may be of any hardness; in fact, in the case of most steels, the harder tempered steels have a higher co-efficient of friction and, therefore heat more easily and rapidly. Most ferrous metals can be sawed on a Tannewitz Friction Saw, but the speed of sawing and the thickness that may be cut with a given speed and power varies much. The cutting rate of sheet steel is only limited by the ability of the operator to handle the work piece. On thicker pieces, the cutting rate varies with the speed of the blade, and the pressure exerted by the work against the blade. Some non-ferrous such as hard aluminum alloys or hard bronze with silicone additives are best cut on a Tannewitz high speed friction saw. The blade cost is much lower than slow speed cutting. Friction sawing does not require a lot of operator training. With a few tires, you can become an expert in friction sawing on a Tannewitz machine. Constant feed pressure is necessary, and for this a hydraulic powered table is useful. The constant pressure of a hydraulic table feed obtains the maximum cutting rate on hard, thick materials. Hydraulic tables are available on all Tannewitz Friction Saws. Friction sawing is here to stay. In some cases, it has become the only method of sawing the hard, exotic metals used by the missile industry. It is also proving itself as the fastest and cheapest method in parting gates and risers of stainless steel casting. It becomes very valuable when you have difficult sawing of odd shaped pieces since the material may be readily held in the hand without any catching of the blade. It is the most rapid cutting method for metal whether it is mild steel or hard stainless steel, short of the large shears. Within its work thickness capacity of very thin up to 1”, lies a whole field of cutting possibilities. Since it is not necessary to change the blade for different types of materials, a Tannewitz friction saw is the most useful all-purpose machine found in a fabricating shop. The easier operation, the versatility of the cut and the low tool cost combined with simplicity of the machine will demand constant use of friction cutting in all types of industries. Any manufacturer who works with ferrous metals should consider the possibility of friction sawing on a Tannewitz high speed band saw. Standard carbon blades can be used for friction cutting, but most blades manufacturers make a blade of special alloy steel designed to resist fatigue when operating at friction cutting speeds.